With the summer months come an onslaught of music festivals. From Chi-town’s Lollapalooza to San Francisco’s Outside Lands, festivals hit it hard and Los Angeles is no exception. We’ve got our own Sunset Junction, Sunset Strip Music Festival and finally during labor day weekend the one-day big daddy, FYF Fest, to bid summer farewell. 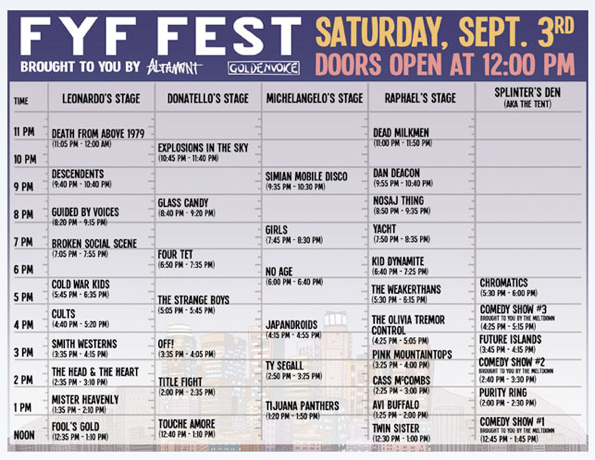 Now I’ve got to be honest for a moment for fear of sounding like a hypocrite, last year FYF Fest left a bitter taste in my mouth. You can read my review here, but in a nutshell it says that the artists and audio were stellar but that FYF was in no way prepared for the onslaught of musicheads that melted in the blazing Los Angeles summer heat. In that same recap I didn’t say I wouldn’t return but I did say I’d think twice. Well now with FYF’s collaboration with Goldenvoice (the godfather of Coachella!) thinking twice isn’t even necessary. If any organization knows how to handle a festival, it’s Goldenvoice, so hells YES I’ll be there and so should you! Headliners this year include The Descendents, Death From Above 1979, Explosions in the Sky, Broken Social Scene, and Cold War Kids. Seriously. And the list of talent goes on and on and on from Yacht to Cults to Smith Westerns to OFF! and Girls and Four Tet and The Head & The Heart and, and, and… incredible. 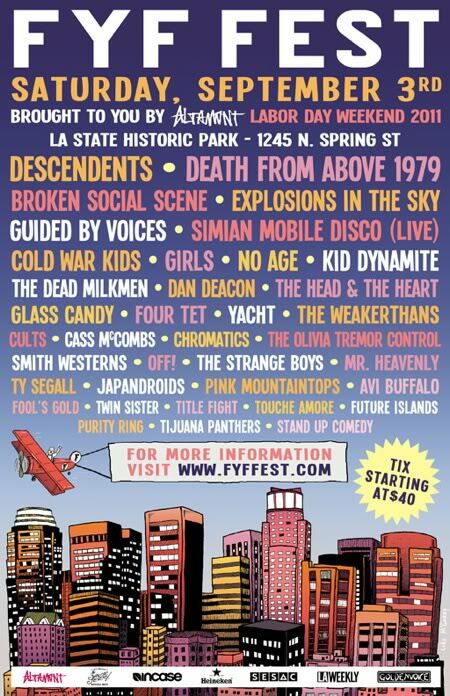 This year FYF Fest will be held again at Los Angeles State Historic Park and will run from 12:00pm to midnight. The event is open to all ages so bring your bambinos, but don’t forget their mini headphones because this day is going to kill. Tickets start at $40 and can be purchased . See you there!